The market continues to show improvement. Our inquiry traffic via phones and internet has been very solid. We had over 800 inquiry calls just last week for only 27 listings. That averages to nearly 30 calls per property. Of the 800 calls, we only converted 3.9% or 31 of those into showing appointments, which is much smaller than average. This tells us that prospective renters are very busy phone shopping. We had 6 appointments cancel for one reason or another and an additional 4 resulting in no shows. Applications were given to all 21 potential renters that we showed properties to last week. Of those 21, eleven submitted the applications for a property. Of those 11 applications, 6 were approved, 2 were approved with a co-signer or large deposit, and 3 were denied for either credit, criminal, or income issues. We signed 5 leases last week, as most of those were the result of approved applications from the week prior. So you can see, the lead generation is outstanding and not counting internet leads, our inquiry to lease conversion ratio is approximately ½ of 1%. Again, that is lower than average and simply indicates that even though inventory levels are low across the Boise area, tenants continue to shop the MOST for the LEAST. As the graph below shows, our current vacancy rate is 1.9% compared to the nearly 7% a year ago during the same time period. Above I talked about leads. I agree that the more leads we get, the more showings we’ll get, which will lead to more approved applications. 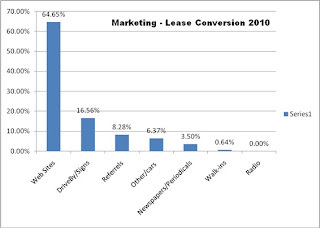 However, when analyzing where to advertise, we ignore leads and simply look at what created a signed LEASE. 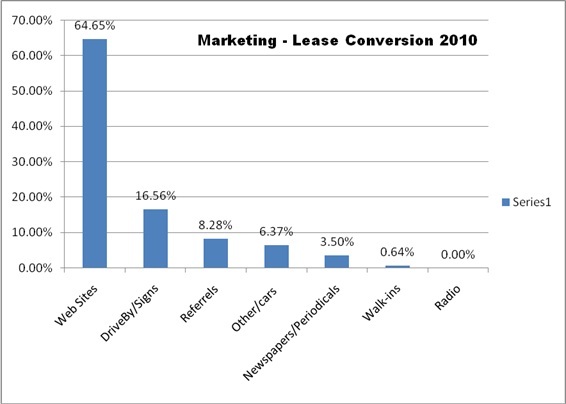 The graph below shows what marketing efforts actually resulted in an executed lease. As you can see, the internet is the main source. In our tracking, we actually break this down, to Craigslist, our own website, and the 200 other sites that we feed our listings to. However, that tracking is unreliable. We put a link to our own website on all of our advertising. It is very common for a tenant to come across one of our Craigslist listings and click on the link to our site to view the virtual tour, detailed descriptions, and photos of the property and even submit an online application. Our tracking will recognize that http://www.frpmrentals.com/ was the source and when we confirm with the tenant at the lease signing, they tell us the same thing, as they forgot that they actually found us somewhere else originally, which lead them to our site. The same goes for print advertising. Many of our applicants see us on our print advertising which pushes them to our website and then cite that our website was the source of their inquiry. Online internet advertisers know that they are the main lead generator and these sites are becoming more and more technical for tracking and backend reporting. They are also changing it up to upsell us. For example, http://www.rentals.com/ is one of our largest lead generators. They use to just list everyone’s ads in order of user criteria. However, like all internet advertising, they have found that if we place an ad on the banner, it will have a much higher click rate. My point is that internet listing sites are getting smarter and figuring out how to increase the cost per ad. However, over the years, we have been fairly successful in getting away from classified ads in the local paper, which were indeed the highest cost of advertisement. This is why most of you have seen a decrease in the advertising costs. We still use the newspaper, but we’ll submit a single ad that describes multiple properties within that same area. That ad may cost $350, but is to the benefit of 5 properties, so the pro-rata share is $70 per property. Lastly, I wanted to discuss Craigslist. Craigslist is one of those bitter sweet things. People like it, because it’s free. However, because it’s free, it falls prey to scammers. Every day we get responses from someone who is an obvious scammer. They want to rent the property and will send a cashier’s check, which is for more than what is needed and we are to cash and save send them a check back for the difference. Also, if you recall, I posted a news broadcast where the scammers were stealing property manager’s ads and posting them as their own at super low rents. Craigslist is our largest lead generator, but we have to weed thru and be constantly leery of scams. Also, because everyone is using it now, we have to re-post our ads constantly to be on the top. So we have a staff person, that spends 15 to 20 hours a week creating new Craigslist ads and updating existing ads. So much for being free. Like I said, I personally think it would be better if Craigslist actually would start charging a small fee. That should eliminate a majority of the scammers. Then if they would create a criteria search so that no matter how old the listing is, it ranks the listings by most qualified to the requested criteria. OK, can you tell I’ve put a lot of thought into Craigslist and the inherent problems we go through by using it? You probably received an email from the accounting department about some changes regarding posted rents. It’s complicated so let me first describe the issue. The issue was that if a tenant received $250 off the first month’s rent as an incentive, our software posted full rent and automatically deducted the management fee. Then we would manually enter in the $250 and then deduct it from rent so that your income was not overstated. However, the system did not automatically deduct the small difference in management fees. So the owner was paying management fees based on potential rents and not actual rents. Like I said, it’s complicated to explain why this happens and all the different things we tried to work around it. We came up with a workable solution that will help and only create a little bit of extra work for us. So if there is a RENEWAL or MOVE-IN INCENTIVE, you will actually see that posted as an account in the Description section on your statement versus RENT. For example, if we placed a tenant in a property that rented for $1,000 and received a $250 move-in incentive. You would see $750 posted as RENTS and $250 posted as MOVE-IN credit. Again, the reason we did this is that it saves our owners some money on management fees. Another change made this year concerns multi-family buildings. In the past, we have posted mortgages, HOA dues, and any common area bills to the first unit, such as #101. This year we will post these bills to the property. You’ll see the expenses on your statement after the unit accounting. We made this change based on owner requests who were wanting those building or common area bills outside of the units, so that they could analyze actual unit costs.